Welcome to Stop #13 on the Triple Threat Blog Tour featuring Myra McEntire, Kate Ellison and Jennifer Lynn Barnes! 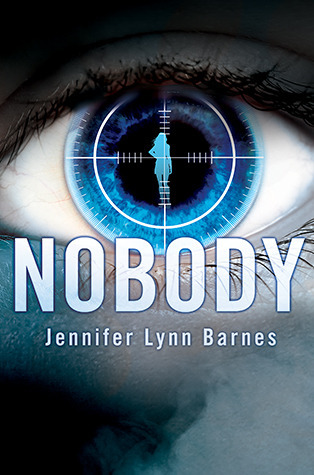 Today we welcome Jennifer Lynn Barnes, author ofNobody and Every Other Day. Don’t forget to scroll to the bottom of this post for a great giveaway I am hosting and for details on the Triple Threat Blog Tour grand prize giveaway! First up, an amazing piece of the Infinity Glass puzzle! Ohhhhh, ahhhhh! * Submit the assembled cover via the LINK by no later than 2/12 at 10pm ET. You will be entered to win the 6 book Grand Prize Giveaway of: Jennifer Lynn Barnes' Nobody and Every Other Day, Kate Ellison's Butterfly Clues and Notes from Ghost Town and Myra McEntire's Hourglass and Timepiece. I’m a bit freakish when it comes to music. I tend to listen to one song, over and over again on repeat, until I get sick of it—which usually takes much, much longer than everyone in my near vicinity would like for it to. I have, in the course of my adult life, spent entire months listening to a single song, or possibly two. I don’t always listen to music when writing books, but if I do, it often ends up being a single song for the entire book. For NOBODY, my book about two supernaturally unnoticeable teenagers, one an assassin and the other the girl he’s sent to kill, it was actually two songs. This book was my first time writing third-person, and my first time with two narrators. The narrative point of view switches frequently from Claire to Nix and back again. To help keep their voices separate in my head, I’d switch songs each time I switched point of view. Claire’s song was MORE LIKE HER by Miranda Lambert. It’s this very simple song—just a guitar and Miranda’s voice for parts of the song, and throughout, the narrator is talking about all the ways she doesn’t stack up, all the things she should have done differently, all the ways she should have just been different. The situation the song describes is WAY off from anything Claire is involved in, but for some reason, the repetition of “I should have been more like that” and “I should have been more like her” felt very Claire to me. The vulnerability to the song, and the longing, and the just wanting to be loved, but realizing you’re not and thinking maybe you don’t deserve to be—that’s pretty much where Claire starts the book emotionally. She’s spent her whole life being ignored and not knowing why, and she honestly believes that if she could just be better somehow, she could make friends and be the kind of daughter her parents would care about and matter to someone. Anyone. Unbeknownst to Claire, though, she is both right and wrong: she’s right that there is something about her that makes it difficult for other people to care about her, but she’s wrong about it being something she’s doing wrong. There’s something else at play here—whether you want to call it supernatural or metaphysical. Ironically, Nix—who is, in many ways, the much more broken character of the two of them, having been raised as an assassin who has been explicitly told from childhood that it is physically impossible for anyone to care about him—got a much more upbeat song for his chapters: BLESS THE BROKEN ROAD by Rascal Flatts. Nix’s road to Claire is very broken—we’re talking about a teenage boy with a kill count in the double digits—but at the same time, that road ultimately does lead him to Claire—who he is supposed to kill, but can’t. WIN a finished hardcover copy of Nobody and the new paperback edition of Every Other Day. US/CAN only, please. Fill out the fancy doo-hickey to be officially entered.